GINGER AKA CHICKEN HEART GETS THE BIG SNIP! Many neighbourhoods in Toronto have a feral (wild) cat population. 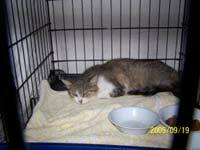 A feral cat is a wild cat, as opposed to a stray cat which is usually either lost or abandoned. Strays are usually fairly tame. Ferals are usually un-tamable (or rather very difficult or time consuming to tame) and cannot be handled. Many cities have programs of spay/neuter then release back, to help control health and numbers of wild cat population. UPDATE: Recent photo of my clan. Fat sleek and healthy. Here 3 of the remaining 5 cats of my clan have a settled calm life. 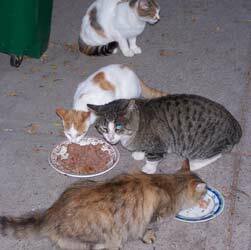 Controlling stray and feral cat populations is a difficult problem. There is a great deal of opposition to euthanasia as a method of control and adoption is often difficult. Not only is there a large number of cats without homes but many are not all that adoptable. The costs of running adoption facilities are high. Spay/neuter/release programs have the advantage of controlling populations by neutering wild cats and do not have the moral dilemma of euthanasia. The cats are captured using humane traps, are quickly neutered and checked for various health issues then released after a period of recovery. Males can be released quite quickly, females need a few days to heal. I have a small colony I look after. There are no longer any breeding females so it is not producing new kittens. 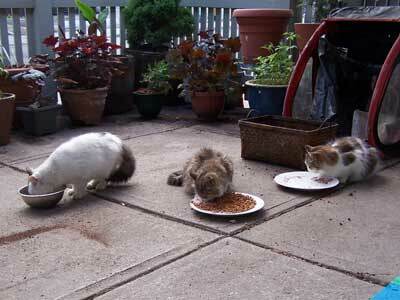 I am seeing some new faces mostly from neighbouring clans "visiting" the feeding station. Some of my clan, given a treat so I could photograph them. Mama was the matron of the clan. Quite old by feral standard. Here not too happy after being spayed. She was released, and to this day is fatter and looks as good as is possible. Efforts are made to reduce stress on the animals. The result is a neutered cat back in its original environment, not adding to the overall population and which shows an increased level of health. Not only are territorial fights reduced, but overall health of the colony is increased. The Annex Cat Rescue organization has been active for several years to trap and release feral cats, to help tame and adopt what kittens can be captured, to provide food and help to some feral colonies. We have a network of volunteer foster homes for cats waiting to be adopted and for cats recovering from neutering and from other health problems. The occasional stray gets assistance as well. We are not an emergency animal rescue group, we have no offices, and we are VOLUNTEER run. Tessie Before and After. 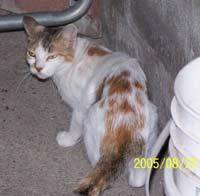 Tessie in her before shot has had kittens and is thin and covered in sores. Shortly after this picture was taken she was captured and spayed then returned to the colony. She however had other plans and 6 months later, volunteered to be tamed. This is highly unusual for ferals who almost never tame. She was brought in and after a few weeks in my bedroom, was put in a foster home. She eventually was adopted and lives a life of luxury. She was Mama's daughter and extremely clever. Some of Mama and Tessie's kittens taken in and raised by hand. A serious commitment, with feedings every 3 hours even at night. 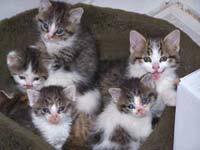 Kittens have dirty noses because they are learning to eat by themselves. They were all happily adopted out and Mama and Tessie their mothers were spayed. Tessie eventually decided to tame and was happily adopted. Mama remained wild till she died of a stroke at the age of at least 15 years old. The Annex Cat Rescue is a not for profit and exists as a result of the generosity of members, the sale of catnip toys and other member produced items, and donations. There are minimal administrative costs. No one is employed and there are no paid for premises. We do have significant VET expenses. We oppose euthanasia as a means of cat population control. Because of our fostering system, cats which are offered for adoption have not been kept in cages and we attempt to socialize the animals as much as possible. So if you are looking for a cat to adopt let us know. If you are interested in helping let us know also! Advantage drops is one of the most succesful way of controlling fleas on cats. I use it on all my cats and if I get to capture one of the ferals they get a dose as well. It helps control tapeworm and ear mites as well.